Welcome to the 3rd post in my Welcome to Firestorm Lore series, in this post we will be looking at the story of the reptilian Sorylians and how they came to be the power they are now. So sit back and enjoy. Skvarr: The Skvarr are slightly larger than a man and more heavily built, they are also the most numerous sub species in the collective. Kon Avarr: The Kon Avarr are much large than an average man, around 10 feet tall and built for strength and endurance They are the most simple minded of the sub species and often used for manual labour, when a Kon Avarr sets his/her mind to a task they set about it with impressive single minded determination. Slivarr: The Slivarr are man sized and wiry. They have a curious and inquisitive nature and were the first of the Sorylians to encounter the Terrans (who named them the Saurains). The story of the Sorylians in Firestorm starts with an a series of wars referred to as “The Great Rending”, these wars were fought on the Sorylian’s home world of Kerender and were a series of wars between the sub species for dominance over the race as a whole. The only good thing that can be said for these wars was that the fuelled rapid technological and intellectual growth amongst the Sorylians. When the Great Rending ended there was a species wide meeting held at Harrakas, today the largest city on Kerender. The meeting took 600 years to complete, this being due to the slow and methodical nature of the Sorylians, but when it ended its rulings would have far reaching consequences for the Sorylians. It was decided that all the sub species would work towards a common goal, in this way they would become far greater than if they strived against each other or alone towards individual goals. This choice set the Sorylians up to become a mighty interstellar power although none at the time knew it. The first act of the new Collective was to rebuild their home world of Kerender after the years of constant warfare. It was during this time that the Slivarr managed to prefect wormhole travel and launched the Sorylians into the stars. Soon they were exploring their home system, building orbital dockyards and generally taking to the stars with general enthusiasm. Soon Kerender was rebuilt and the exploring and colonizing of space began. The Collective made rapid progress in this area and by the time Egypt rose to prominence in Terra the first wider Sorylian expedition began. By the time this effort had ended 2000 years had passed, the Sorylians had colonized and explored vast tracts of space around Kerender, this area would become known as the Greater Sphere and is still the most prosperous part of the Collective today. While this was a time of great prosperity for the Collective it was also shadowed by war. As they expanded the collective came into contact with the Ba’Kash, a alien race of marauders and pirates who attacked and raided new colonies and supply convoys. In response to these attacks the Collective started building warships and training ground units. As these raids went on they slowed the progress of expansion and for the Kon Avarr and Skvarr this wasn’t an issue as they preferred the slower pace, however for the Slivarr this was an issue. They chaffed at the new restrictions and some even founded illicit colonies in remote regions in order to satisfy their curious nature. This situation worsened when a collation of Slivarr, led by the Kurchas Tribes, started to conduct secretive research into advanced wormhole travel. This was done in secret because the Grand College, the ruling Sorylian body, had forbade pushing wormhole technology too far fearing dire consequences if anything went wrong. And while reality wasn’t rent open by the research some Kurchas research stations were vulnerable to attack from undetected Ba’Kash tribes that had inhabited the systems were the research stations were set up. Eventually some of these stations were overrun and the Ba’Kash looted valuable wormhole technology allowing them to start exploring different systems as opposed to just being limited to their local system, to make matters worse the Ba’Kash gained access to the Collectives wormhole network and started to raid deep within the Grand Sphere. Soon the Kurchas Dissidents, as they had become known, were called before the Grand College and condemned for their actions and the consequences they had lead too. This condemnation combined with the ban on wormhole research eventually lead to a Kurchas chieftain, called Cra’Slys, declaring her intention to move her tribe out of the Grand Sphere and establish a separate Slivarr domain, she put the call out to all the other Slivarr tribes and soon a mass migration began. The new Slivarr domain was established to the galactic north west of the collective and as the tribes left some of the lesser colleges tried to prevent the Slivarr from leaving, this would be mistake. The greatest conflict since the Great Rending began from this misguided attempt to halt the migration with the first of the fighting taking place on the north frontier of the collective. 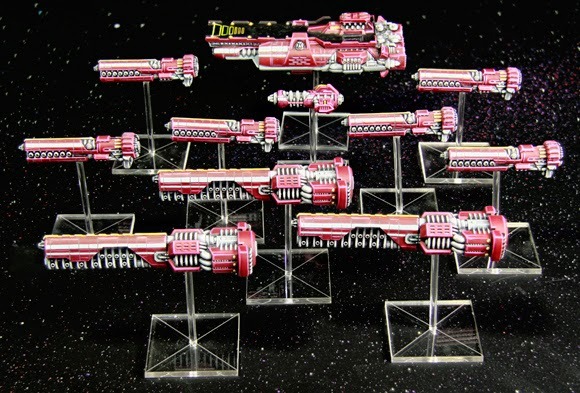 Although they were no physical match for the cousins the Slivarr were excellent scientists and had superior warships which woeful soon be augmented by atomic weaponry which they would deliver with deadly precision due to their mastery of wormhole travel and the collective’s wormhole network. At the climax of the fighting a full 100 systems were fully engaged in war. The war went on for 5 centuries and was made worse by Ba’Kash raids on both sides. During this time several Aquan colony fleets were assaulted in the Storm Zone after they were mistaken for Slivarr warships. This caused relations to break down between the two species and would only be fixed far in the future when the Terrans would bind the two species together in the Kurak Alliance. Eventually an uneasy peace descended over the two Sorylian empires with neither side really trusting one and other. As a side effect of this the collective lost the Slivarr and as such most of the dynamic element from their empire. Northward expansion halted entirely and scientific research and expansion became more conservative. Some centuries later Terran explorers showed in the Crael spheres and for a time the governing college of the Crael Spheres were content to simply watch the “Warm Bloods”, as they called the humans, this wouldn’t last. The trouble began because the Terrans had encountered the Slivarr, who they referred to as the Saurians, first and had enjoyed peaceful and bountiful contact with them. Human settlers in the Crael Sphere tried to contact the Sorylian’s using Slivarr language and symbols which the Crael College mistook to mean that the Slivarr had tricked the Terrans into attacking the Sorylians and soon war broke out. This was one of the Wars of First Contact fought by the Terrans and by Sorylian standards it didn’t last long mainly due to the fact that the Sorylians recognized that the Terrans were fighting a defensive war while constantly trying to make contact with the Sorylians, Soon the Grand College called for a cease fire and Terran and Sorylian diplomats met and discussed peace terms. What followed was mending of relations, not just with the Terrans but with the Slivarr and the Aquans as well. The Sorylians did this because they realized the best way to preserve their domain was to make peace with major galactic players. In order to further this effort they also allowed the Terrans to expand into the Fathoms Reach and Storm Zone in order to make a buffer zone between themselves and the Aquans who still remembered the fate of their original colony ships. As for the Slivarr the entire Terran empire stood between them and the Collective so they would no longer have to be concerned about them. Shortly after this the Sorylian and Terran scientists created the Fold Space drive and revolutionised space travel. This helped to fuel Terran expansion and from this expansion the Sorylians learned of the Relthoza, a race they never even guess existed. The Sorylians were somewhat concerned by the rate of Terran expansion but reasoned that the Relthoza’s own drive for expansion would cancel out the Terrans, they were wrong and soon the Terran Empire covered most of the known galaxy, this however wouldn’t last. While the Human secession wars are key to the Dindrenzi and Terran stories they had little immediate impact on the Sorylians. In fact the Sorylians underestimated the impact these wars would have on the galaxy. It was only when this threat was fully realized long after the Dindrenzi gained their freedom that the Sorylians began to prepare for the coming war that was now obvious. 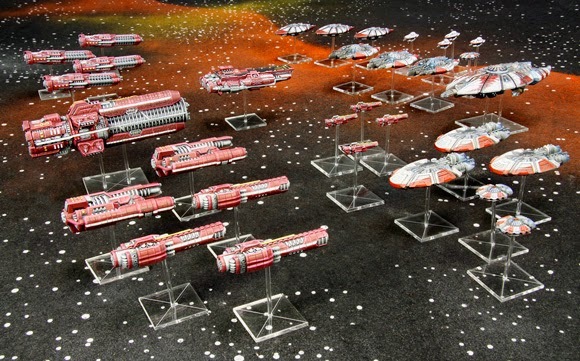 The joined the Terran’s Kurak Alliance, prepared their fleets and waited for the oncoming storm to hit. The Sorylian Collective has weather much in its time and knows the art of war well, only time will tell if they will survive this war but one thing is certain, they will not go quietly. 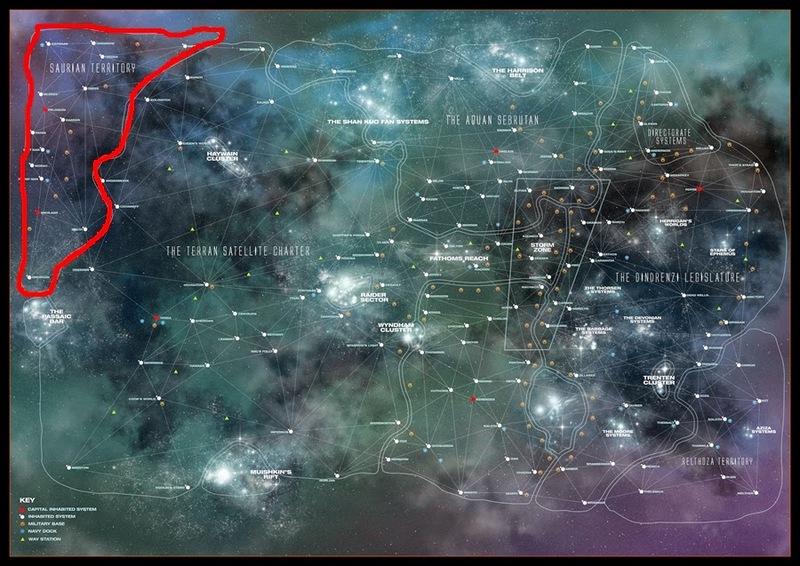 As with the Terran lore post the he majority of the material used in this post was taken from the Kurak Alliance source book, however I didn’t use everything and the book contains more than is in this post. 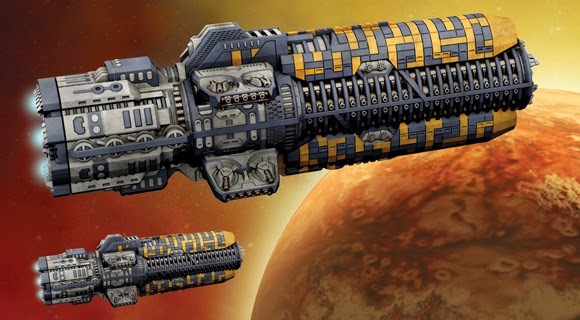 The book has lore pieces for each Sorylian warship (as well as the other 2 main races in the alliance) it also has lore pieces on famous Terran, Aquan and Sorylian fleets so if you are interested in finding out more feel free to check out Spartans store and get it. Until next time.